ACCU-SCOPE Inc. introduces the new EXC-400 Microscope. Specifically designed for clinical and research applications, the EXC-400 delivers high quality images, and boasts a long list of standard features that are demanded by technicians, physicians and researchers for cost-effective operation for years of worry-free use. An impressive list of standard features, plus a long list of optional components and capabilities. ACCU-SCOPE Inc. is pleased to introduce the EXC-400 Microscope, the latest addition to its growing portfolio of microscopes specifically designed for clinical and research applications. The EXC-400 redefines quality, durability, convenience and efficiency for a broad range of microscopy applications in clinical, academic and research environments. The EXC-400 is ideal for routine observation of specimens but is, itself, far from routine. Standard features of the EXC-400 include a trinocular viewing head, a wide 22mm view through the eyepieces, a ceramic hard-coated stage for maximum durability with repeated use, a quintuple nosepiece for holding up to five objectives, infinity corrected optics to meet the latest demands of technicians and researchers, and LED illumination for dependable cost-effective operation for years of worry-free use. The EXC-400 can be configured for several contrast methods including brightfield, phase contrast, polarized light, Gout analysis, and fluorescence featuring integrated LED illumination and Chroma® filters. The standard Plan Achromat objectives provide excellent color reproduction and resolution of details, and the optional semi-Apochromatic objectives are an excellent choice especially for fluorescence observation and imaging. An optional dual observation attachment allows two people to view the specimen simultaneously, perfect for discussion and training. The new EXC-400 is available now from ACCU-SCOPE. 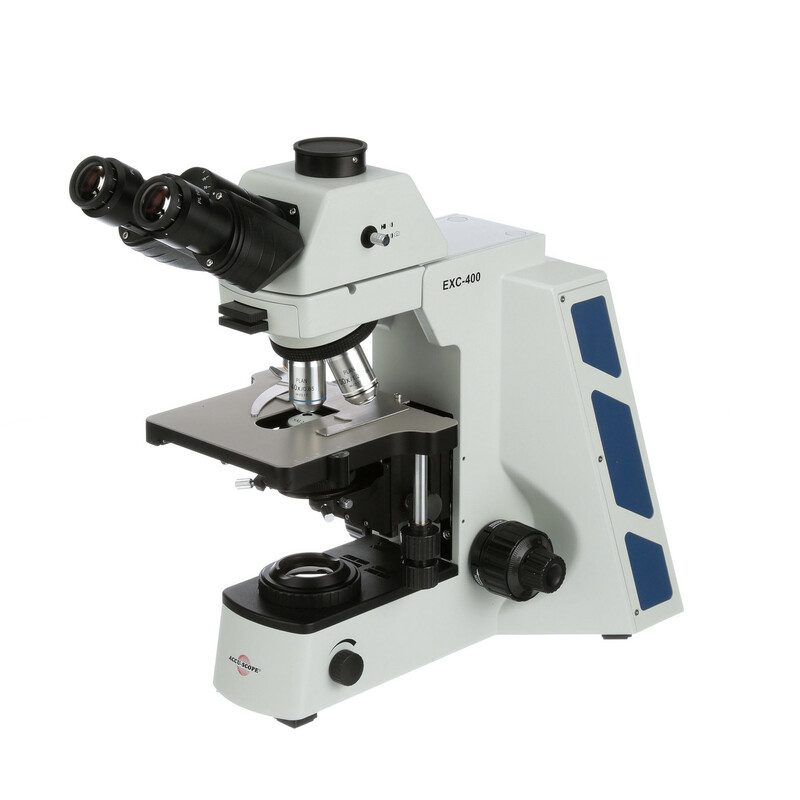 For more information, visit the product page at http://accu-scope.com/products/exc-400-microscope-series/. ACCU-SCOPE, Inc. is a world leader of high quality, certified microscopes for clinical, research, educational and industrial applications. For over 60 years our optics are renowned for crisp, high contrast images with outstanding resolution. All mechanical components are manufactured and assembled to the strictest quality standards. Our products are available exclusively through a nationwide network of authorized distributors and backed by our industry leading five-year limited warranty. Visit us at http://www.accu-scope.com.